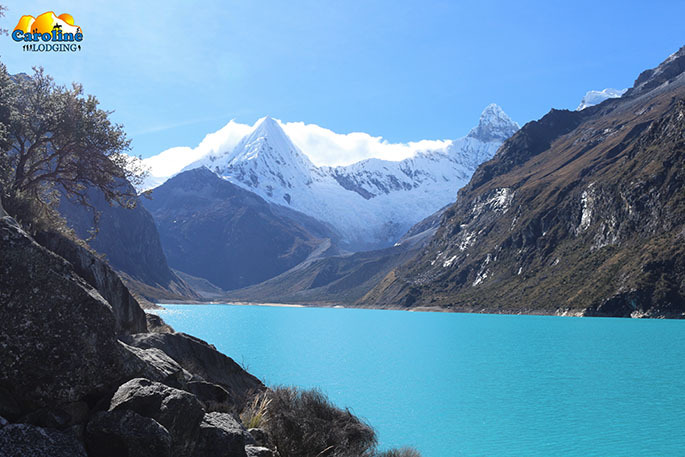 This lake, the largest of the Cordillera Blanca , is located at an altitude of 4.155 m.a.s.l, and is surrounded by at least 8 glaciers.Among them the Artesonraju ,( which would have inspired the logo of the Paramount Pictures), the Pisco.Huandoy and the Agujot. Caroline Lodging is managing the refugio .We have 1 dormitory of 4 Pax and 1 of 6 Pax available.There is a kitchen and a fireplace. We recommend a 3- day trek with 2 overnights in the refugio you can easily do by yourself and without a guide.If prefered we can organize everything at your request. Day 01 : Transfer to Caraz and with a taxi to the refugio.After lunch you can hike up to a first viewpoint over the laguna. Day 02 : Starting out early, you hike along the lake and then up to the glacier of the Pyramid,(4950 m.a.s.l.) Spectacular views of the 8 surrounding glaciers.Hike back to the refugio and second overnight at the refugio. Meals included for the duration of the trek. Entrance fees for the local communities. 240 PEN(Soles) FOR A GROUP OF 6-7 PERSONS. 280 PEN(Soles) FOR A GROUP OF 4-5 PERSONS.